With an almost brand new team, we made it just in time for the Oregon Competition. Several setbacks prevented our team from doing as well as we had planned, but nonetheless, our team pushed until the very end and gained a great amount of experience. With almost every design member returning next year, we plan to excel like we know that we can! Final comp of the year, saying goodbye to 11 seniors, but it was a memorable weekend nonetheless. We made it to our second design finals this year and even managed to place 3rd. Our sales team made a drastic improvement from placing in the 20s to getting 6th. Overall we didn’t do as well as we had hoped, but we had a good end of the year as a team and as a family. Despite a tornado warning, hail, and a lot of mud, Stella stuck it through and had her most successful comp weekend. The design team made it to their first design finals in years and were able to pull it off with a great presentation. Overall, the team proudly pulled off 4th Overall. With the first comp with our eCVT, we had some unexpected failures despite hours of desert testing. Even though we had to spend about an hour out of the endurance race, we managed to make an impressive comeback starting at the high 50s in placing and ended in 13th. What a challenge.. Gorman California was a fight the whole way through for us, but we came out with a few successes of our own. We’re thankful we had a first time California Baja SAE event, and we’re looking forward to doing even better come 2017’s Gorman event. Tennessee Tech was a pretty decent start to our 2016 competitive season. We had our challenges and we finished 1st in Sales Presentation and 10th Overall in the competition and look forward to Gorman California. We had a great time out in Oregon! We received 4th place in the endurance race and 10th place overall in the competition. We are thankful for the experience we had and we’re preparing for next season! Our team made it out to Auburn, Alabama for the first competition of the 2015 season! The first two days went smoothly with the new team tying for 6th place in Design, even in the heavy winds and rains of Alabama! The next day, Car #108 (Sheila) made its way to the first dynamic events. First was acceleration, followed by maneuverability; running a 67 second run placing the team at 20th for the event. Next up was Hill Climb, and Suspension and Traction shortly followed. Driver Max Mitchell put down a record time over the logs, tires and stakes of S&T, posting a time of 56 seconds; placing 6th in the event! The Endurance Race was all that was left. After a night of rain, the course was freshly muddied and prepped to take down some cars! The race started with Car #108 positioned about 30th in the pack, with a grid motocross style start. Within hours Max had moved his way up to the top 10 position! Cars broke down left and right, but Car #108 held strong finishing the race as one of the only cars not to break down during the entire race; only having to stop in the pits for fuel! Max did not find out until he had gotten out of the car when the race was over, that he had won the Endurance Race! The new team performed excellently at their first competition of the year (for many of them it was their first competition), placing 1st in Endurance, 6th in Design, 6th in Suspension and Traction, and 4th Overall! The team will be heading to Oregon in late May for the next event where they hope to out do themselves again! 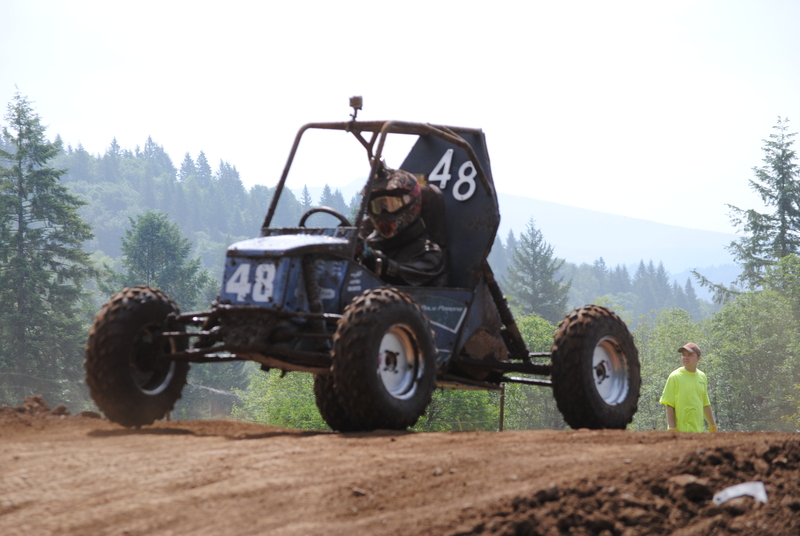 In a field of 85 universities, Cal Poly Pomona placed 6th overall @ Baja SAE West – Washington. Other notable scores included 5th in the endurance, 7th in design and 10th in sales and presentation. The team showed their exceptional engineering and manufacturing skills as the vehicle experienced no issues over the course of the competition. The 2013 Baja SAE racing team and car are home from competition in Tennessee. At the annual competition the Cal Poly Pomona team took home an 11th overall spot, as well as placing 9th in endurance racing. Cal Poly Pomona is well known and respected for building a competitive and durable vehicle for the Baja SAE competitions. Considered one of the premier teams in California, Cal Poly Pomona has steadily improved within the Baja SAE ranks in the past two decades. The teams always set goals of placing in the top ten.